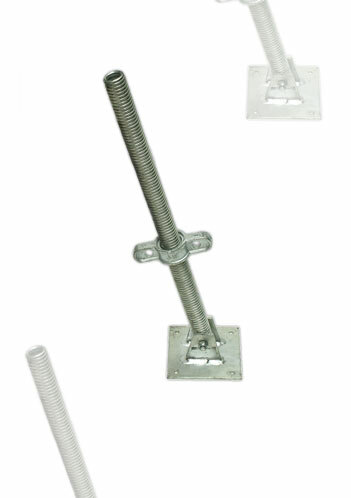 Swivel Base Jacks are designed as a falsework application, and are generally used as an Adjustable Base Jack. The stem of the Adjustable Swivel Base Jack is riveted to a square double lug Base Plate, this allows adjustment on uneven ground. The rolled thread tubular process offers an approximate weight reduction of 50%, but maintains and exceeds the strength of a solid cut bar as non of the material is cut away. This improves handling and lowers ransport costs. Thread rolling offers a superior finish achieved by the burnishing action of the rolls, with no toolmarks or tearing. All SCP Jacks are manufactured in accordance with ISO 9001:2000 quality system accreditation.